87 natural acres with a prairie-style 2,883 sq. ft. red brick home built in 2004. (Home with 6 acres can be purchased separately.) Located just a few miles south of Steeleville IL. Property includes a wooded stream (Rock Castle Creek) with exceptionally beautiful rocky outcroppings (Devil’s Hole) and waterfalls along with natural prairie areas. The home boasts geothermal heat/cool, good well, aeration septic system and 3-car plus attached garage. Wheelchair accessible throughout upper level. Open floor plan; kitchen, dining and living room with 9-foot ceilings throughout. Vaulted 15-foot ceiling in living area. Mudroom, laundry room, 3-season porch, pantry, powder room, 20 picture windows throughout, master bedroom suite with sliding glass doors to an outdoor wrap-around deck overlooking the surrounding area. Indoors 2 stairwells, one to unfinished dry basement with 9 ft. ceilings, one to finished lower level that includes walkout, office area and 2nd bedroom suite with bathroom. Could be a perfect property for multifamily living with private entrances. 90% native landscaping including trees, shrubs, grasses and perennials. Abundant bird, reptile and mammal species including Barn owls, Red-shouldered Hawks, Chuck-wils widow, Bobcats and more. A 2-acre spring-fed, 16-ft. deep lake with sandy beach and deck is located near the house. Property has been enrolled as a Protected Natural Preserve. Deer management may be allowed. This property is 2 hours to St. Louis International, 40 minutes to Carbondale IL, 40 minutes to Perryville MO. Steeleville school district. 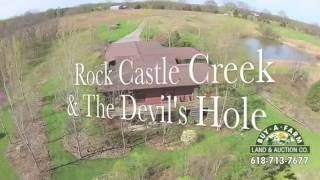 Directions: Approximately 2 miles south of Steeleville IL on Rock Castle Road. Turn right onto Rock Castle Lane. Property starts at road.